2015 Big Board– How Do We Rate Mudiay? These prospects are all high floor high ceiling studs. I would grade all of them in the range of a high end #2 pick to an average #1 in an average draft. Towns gets #1 because he’s a two way big prospect, and then Winslow and Russell are exceptionally close for #2. I favor Winslow because of his late season destruction and awesome tools, but Russell’s skill package is exceptional and he could be quite the offensive weapon. Whoever drafts these guys in the #3-5 range are going to be winners in this draft. Note: I rate all three players below Joel Embiid and above all other prospects in the 2014 class. Okafor is the most skilled low post freshman NCAA scorer I have ever watched, and I believe it will translate to the NBA given his monster size, length, hands, as well as footwork and rim touch. But he has holes in his game that the other top guys do not, and his lack of rim protection and shooting makes it difficult to place him in a lineup that maximizes his awesome low post scoring. He fits comfortably into the #4 slot on my big board, as there is a wide chasm between the top 3 and the rest of the class. Assessing Mudiay’s draft stock is an interesting topic. I am a big advocate of swinging for the fences, since upside is far more important than downside and passing up a future star for a decent player is far more harmful than passing up a decent player for a bust. But the mystery box factor actually puts a dent in a Mudiay’s upside, as passing the check point of NCAA competence makes a player more likely to achieve their theoretical upside. If Mudiay had spent this past season in college, he may have been as disappointing as past prospects such as Andrew Harrison, Marquis Teague, Austin Rivers, etc. Based on descriptions that his game needs polish, it is highly unlikely that he would have outperformed his #2 RSCI pedigree and boosted his stock by any significant margin. The fact that he is being evaluated as if he played NCAA and lived up to the hype is insane, as he is avoiding the risk that he falls out of favor with scouts with his flaws under a microscope without any opportunity cost. Drafting him over Winslow or Russell would be an unequivocal mistake with so much more downside and little (if any) additional upside. This point should be especially obvious with the rookie disappointment of Dante Exum, who I believe had a more compelling thin slice. Mudiay’s physical tools are slightly preferrable, as he is more explosive with a better frame but does not quite have Exum’s quickness and is an inch shorter. Both have a gaping wart in their shooting ability, with Mudiay’s being marginally more worrisome. The difference maker is that Exum was reputed as having a superior basketball IQ and feel for the game, which I agreed with based on the one game eye test. I do not believe Mudiay has a poor feel or basketball IQ like Andrew Harrison does, but his decision making has been called into question and nothing shines for him skill wise. Everything is sheer potential– he could be a great PG if he adds polish to his half-court skill. He could be a beast defensively, but I see little discussion of him actually showing noteworthy acumen or intensity on that end. Any discussion of his draft stock needs to come with the glaring red flag that he might be terrible at basketball. There is a point in the top 10 where it is worth taking the risk that he is bad at basketball given his physical tools, which are comfortably above average across the board. With height, length, speed, quickness, strength, and athleticism, he offers the whole package. But he nevertheless does not have the freaky nuclear athleticism of John Wall, Derrick Rose, or Russell Westbrook, which makes playing Mudiay roulette a bit less enticing. I am not sure exactly where to place him, but 5th is the maximum reasonable peak and he could be argued to go a fair bit lower. I am keeping him 5th for now because I don’t have any strong conviction that any of my lower prospects ran above him, but he is much closer to 10th in my book than is to the top 3. These players all have arguments ahead of Mudiay. WCS offers the super power of elite footspeed and quickness in player with legitimate center size, which gives him tantalizing defensive versatility. Offensively he is strictly a garbage man, but he does not force bad shots and his FT% is improving, so he should at least be efficient in his limited role. 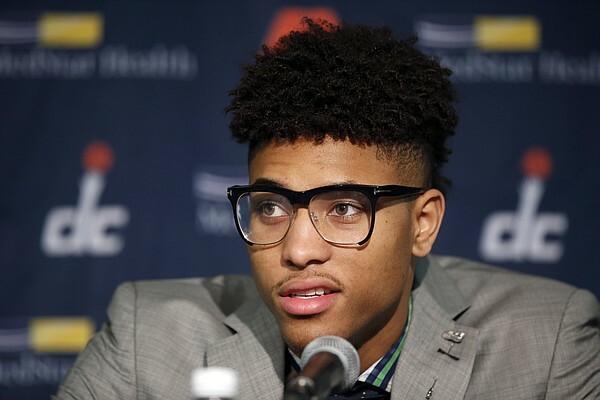 I already shared in depth thoughts on Kelly Oubre and Stanley Johnson. I noted in my writeup that I gravitate toward Oubre being the 5th best prospect, but I really don’t have enough faith in him being actually good at basketball to boldly place him above WCS and Mudiay. For now I am playing it safe and keeping him 7th. On the other hand, I do have loads of faith in Rondae Hollis-Jefferson. He is the Marcus Smart of this draft who is a defensive stud and the type of player who will find ways to help his team win games. His lack of 3 point range or offensive creation skill places a damper on his stock. But he is not a complete zero offensively since he is a good passer, an electric finisher, and has a respectable FT%. With his awesome tools and defensive versatility, I believe it is wise to just take him in the lottery and gamble that offensive game fills out adequately one way or another. Mario Hezonja is a mystery box that I have little grasp on. With his athleticism, I buy the narrative that he has upside so 10th feels like a good place to rank him. ‘Staps is also a mystery box, and with Layne Vashro repeatedly tweeting the Bargnani comparison I have a hard time getting excited for him. With rumors of questionable work ethic and Staps being soft on the glass, it feels like some form of disappointment is inevitable. But he’s young, tall, toolsy, he can shoot, and I have not scouted him so I can’t take a strong anti-Staps position with great fervor. Looney’s stats are nice and his tools seem decent enough. Same with Frank, although smoothness for his size is his calling card rather than physical tools. I want to love Poeltl more, as he offers nice rebounding and defense. But to my eye his offensive game feels a bit choppy, and I am skeptical of his upside on that end. Still a solid guy to take in the back end of the lottery. It’s worth worrying that Tyus Jones will struggle translating his NCAA production similar to Tyler Ennis and Trey Burke, as he is tiny and not exceptionally athletic. But he has awesome skill, razor sharp instincts, and a better first step than his fellow undertooled T’s, so mid-1st round seems like a good time to gamble. Myles Turner offers a unique blend of size and shooting, but to my eye he appears to be a stiff. He doesn’t pass, doesn’t get offensive rebounds, and was oddly inefficient inside the arc given his size and shooting ability. And in spite of his stellar block rate, he is not explosive and does not have the monster size of less athletic rim protectors such as Roy Hibbert or Rudy Gobert. Unless he develops a good NBA 3 point shot that he can get off at a high volume with his reach, I do not see him amounting to much as a pro. Kris Dun has solid tools + solid stats and his mid-1st round standing seem appropriate. But I haven’t scouted him much so my opinion currently lacks depth. Christian Wood I have not scouted, but on the surface he is intriguing to me. He offers rebounding, shot blocking, and has potential to develop into a stretch 4. He dominated in UNLV’s surprise win vs. Arizona, and he was certainly not aided by playing for one of the absolute worst NCAA coaches in Dave Rice. I am not sure he is necessarily underrated, but he is a player I would give a long and hard look if I was an NBA team with a mid-late 1st round pick. Sam Dekker has been receiving loads of hype for his NCAA tournament performance, but to me he is the most bland prospect in the draft. He does not have any gaping weaknesses nor does he shine at anything in particular. I believe he will be a decent rotation player in the NBA, but I don’t see all that much upside. In contrast to Dekker, Delon Wright has all sorts of funky polarity. I suspect that his lack of strength, quickness, or explosiveness will prevent him from translating his stellar college production to the NBA. But with his awesome combination of height, length, skill, basketball IQ, and instincts, he is a unique prospect and it is difficult to place a hard cap on his upside with high confidence. Thus he trades over boring Dekker. This tier is more boring Dekker-ish players. Jerian Grant has an intriguing blend of physical tools, shooting, passing, and shot creation. But he also is old and has an bizarrely low rebound rate which is a bit of a red flag. I like him but feel he is slightly overrated after Notre Dame’s tournament run. Devin Booker is the youngest prospect in the draft and can shoot the lights out, but offers little else. His passing and BBIQ are both solid, but he is a t-rex who is not particularly athletic and has exceptionally low steal, block, and rebound rates. He does not figure to make an impact defensively or with shot creation. He is a bland floor spacer to me. Caris LeVert does a little bit of everything and has decent tools. His value takes a small hit because he missed most of this past season with a foot injury, but he could become a nice role player for a late 1st round pick. Bobby Portis had a highly productive sophomore year– he is skilled, smart, and he plays hard. He has potential to become a solid stretch 4 in the NBA. But his lack of athleticism prohibits him from making a big impact, although I do suspect that his pro defensive impact exceeds what you would expect given his physical tools. Trey Lyles is similar to Portis, and has even better handles and creation ability. But Portis strikes me as the more intelligent player, so I’m giving him the slight edge. RJ Hunter is a 3 + maybe D prospect. Josh Richardson is a maybe 3 + D prospect. Cameron Payne is the funkiest and most unique prospect in this tier. While he has lackluster tools for an NBA PG, he atones with a strong skill set as he guided Murray State to the 14th best kenpom offense in the NCAA. He is somewhat intoxicating to watch, and I feel compelled to make an campaign that Cam Payne has sneaky upside. But I can’t place my finger on a strong logical reason behind this, and with such PG depth in the NBA I do not want to overrate an undertooled PG dominating weak college competition. Rashad Vaughn was the #10 RSCI recruit. While he appears to be a chucker, he posted solid NCAA statistics for an 18 year old. Like Christian Wood I am intrigued to see what he can accomplish once freed from the shackles of his horrific coach. Robert Upshaw has serious red flags in his intangibles since he has been kicked off two college teams, but he is such a monster rebounder and rim protector that I remain intrigued.